AD architectural Digest asked top sommelier from around country what to drink on February 14. Special edition of 100 bottles of P.S. Integrale Brut Vintage 2015. The artist Masa has created 100 bottles to celebrate 10th anniversary of Le Vigne di Alice. “Life is a bubble” is the slogan (and life-style) with which Cinzia Canzian and Pier Francesca Bonicelli identify themselves. And, in fact, they are correct, even if this idea is susceptible of various interpretations. My first inclination is to think of that nimbleness that one must have to cope with the various curves that life sends our way, or of the fragility of being, or even of the Catullian principle of carpe diem. What is clear is that both the idea of “life is a bubble” as well as the name bestowed on this wine—a tad impertinent and ironically provocative—achieve success in arousing one’s curiosity and thus in deciding to explore them both. And speaking of my own personal search, that is exactly how it went. I knew nothing of Vigne di Alice and its Proseccos, so I was led to taste it precisely by these considerations. And I have to say that in addition to an instinctive attraction by a very straightforward, effective communications strategy, there is quite a bit more back story. 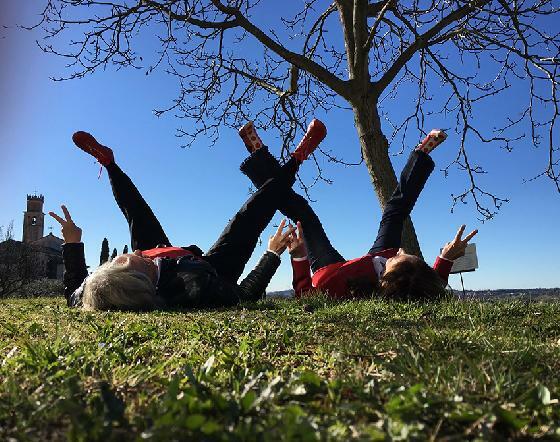 Cinzia and Francesca are celebrating this year their tenth anniversary of concentrating on the production of Valdobbiadene Conegliano, and their wines are considered among the best. They focused right from the beginning on using the classic method and the glera grape (obviously) to produce the highest-possible-quality sparkling wine, striving--as in the case of .g--to convey their personal love for their growing area, as well as to always embody a feminine point of view, to the extent possible in this world. They certainly do display the grit and skills, with expertise gained over the years in their family wine operations. Prosecco has been for quite some time now the best-known wine in Italy and even more so abroad, and it is the only wine that can boast uninterrupted growth. Let’s admit that among wine-lovers and the wine-infatuated there is a certain hesitancy with regard to Proseccos, since the sector is sometimes a tad quality-challenged. But .g breaks through this barrier with ease. I liked it very much with a baccalà carpaccio with pears and lemon peel served at home for dinner. The bubbles were pin-point, the mousse creamy and crisp, the flavours fruity and hinting of toasted almond, the wine easily able to stand up to Her Majesty the baccalà, a dish that I adore and offer often to my guests. I earnestly hope that my bubble can yield a good dose of lightness. This column offers a few brief comments on a bottle of wine enjoyed the previous evening by one of the many collaborators of Slow Wine. The wine is not a “special occasion bottle,” taken out of the cellar to celebrate a special moment, but rather a lovely, everyday, easily-drinkable wine, perfect for both the meal and the pocketbook, in the sense of quality-price ratio. In a word, a fine bottle that provided considerable satisfaction to those who drank it, and one, in particular, that was drained in a second, enjoyed avidly and quickly with the food that partnered with it.